Love those mittens in the blue circle frame! Thanks for sharing with us at Cards in Envy. Adorable mittens and a great background paper. I'm sure either your son or daughter would love it. Wonderful masculine card Billie! I love how you've stamped the background and the mittens are adorable. This is just perfect for any man. What a great masculine card. I struggle with male cards!! Thanks for joining us for our Framed with Circles challenge at Cards in Envy. Love the mittens. Thank you for joining in at QKR Stampede. Great card, love the real string between the mittens. Thanks for sharing your creation with us at Creatalicious. We hope to see you back again. Hey Billie - thank you so much for joining us over at Cards in Envy for "Framed in Circles". I love those mittens from SSS and putting them on a circle frame is a great way to highlight your mittens. Best to you and hope you'll join again soon! nice work! 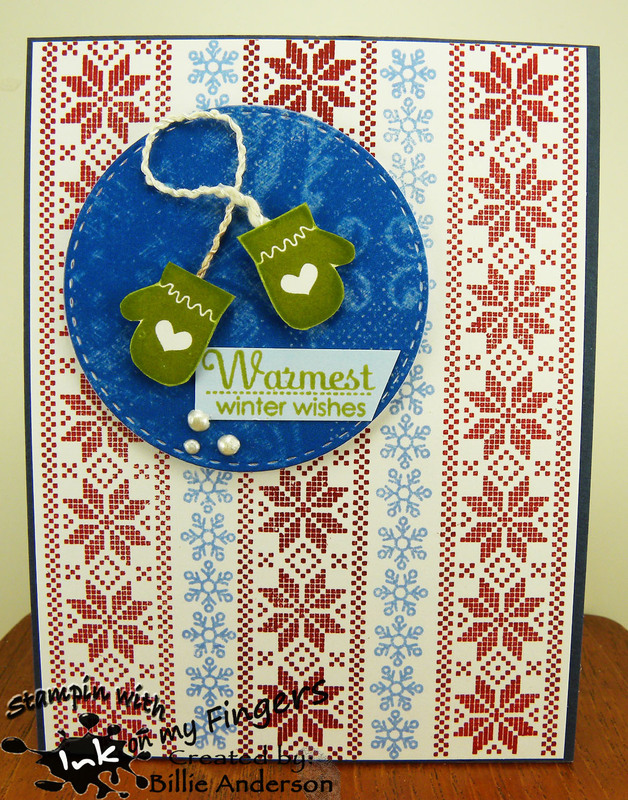 Thanks for joining us at Crafting from the Heart Challenge Blog. Fabulous card, love the mittens and patterned paper! Thank you for sharing with us over at Love To Scrap! Hope to see you again! The knitting pattern background is perfect with those mittens! Thanks again for playing our HeARTful Stamping Challenge! super cute mittens!!! thanks for playing with Cards In Envy!!! Thank you soo much for taking part in our "anything goes with optional monochrome Christmas” challenge over at Creatalicious. To be in for the prize draw you need to link back to our challenge blog though.